Doing what X-Plane makes fun and exciting, we take a ride to the edge of space in the X-Aerodynamics White Knight Two and SpaceShip Two. As many of you already know, I have a long running fascination with the early space program, to include the post WWII continuing development of jet and rocket aircraft. I was twelve years old when The Right Stuff hit movie theaters – the perfect age for a movie like that to put a permanent stamp on my impressionable brain. I ate up stories and non-fiction books about Yeager, Crossfield, Armstrong, and those other pioneers of the rocket and space age. There is something about these flights that have a boost phase, a continuing arc up to apogee, and then a return under control to an unpowered landing that appeals to my sense of adventure and derring-do. Of course, the ultimate of these craft was indeed an orbital vehicle – the Space Shuttle – but those that came before it like the X-1 and X-15 paved the way for great leaps in engineering and understanding the dynamics of hypersonic flight. 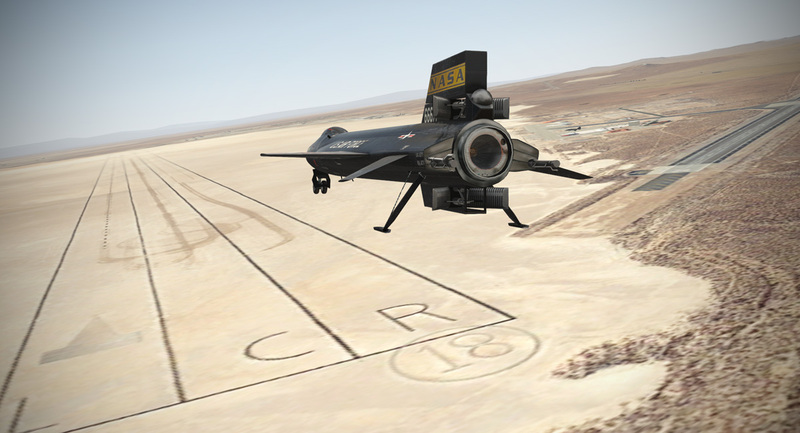 I wrote about duplicating the awesome X-15 flights in an earlier Read It – Do It article. Though decades have passed since the earliest sub-orbital rocket powered flights, the fascination with the edge of space has not diminished. The commonly agreed upon definition of space begins at at 100km (330,000′ or 62 miles) although the U.S. Air Force awards astronaut wings to those who fly above 50 miles. The 100km “Kármán line” is the approximate altitude at which the atmosphere cannot support aeronautical flight since vehicles flying near this zone would have to be flying at near orbital velocity to maintain the lift required for flight. In the mid 90s, a competition to spur private flights to space was announced that would award ten million dollars to the participant that could successfully launch a reusable vehicle to space twice in a two week period. The Ansari X Prize would eventually be won in October 2004 when the Burt Rutan designed SpaceShipOne flew to 103 and 112 km altitudes on September 29 and October 4, 2004 respectively. In the ensuing years, the focus of sub-orbital flights has shifted a bit from discovery to commercialization with the advent of “space tourism”. Several companies are in the process of building sub-orbital vehicles that will give their customers a chance to become space travelers, if only for a few minutes. With ticket prices of $250,000 or more, these aren’t exactly Amtrak fares, but if I had that kind of discretionary income, I’d sign up today! 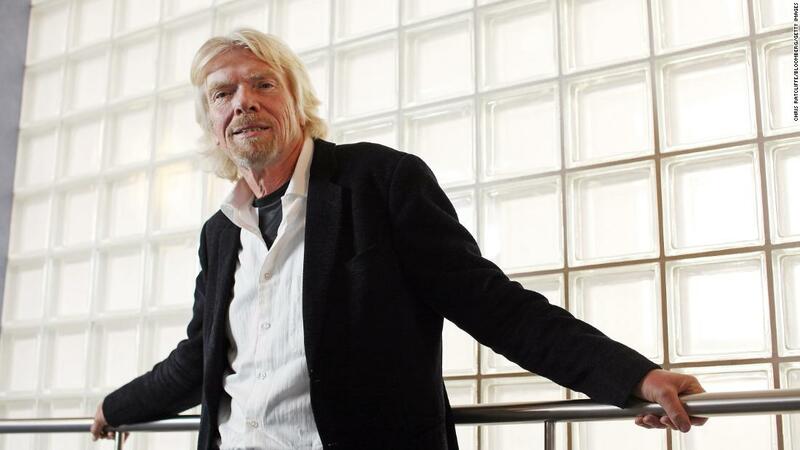 Leading the pack with regards to progress and overall vision appears to be Richard Branson’s Virgin Galactic. Virgin’s suborbital vehicle, SpaceShipTwo, is a successor to the original Scaled Composites SpaceShipOne Based out of Mojave Air and Space Port in California, Virgin and Scaled have been expanding the envelope on their vehicles over the past eight years. The endeavor to put space within the reach of tourists has had serious setbacks, including the death of three Scaled Composites employees in 2007 when a rocket motor exploded on a test stand during a nitrous oxide flow test, as well as the loss of VSS Enterprise in October 2014 after an in-flight breakup that resulted in the death of co-pilot Michael Alsbury and injury to pilot Peter Siebold. The breakup of VSS Enterprise was later determined to be the result of a combination of co-pilot error, lack of training, and a failure to include systems safeguards. In the wake of the VSS Enterprise accident, there was a swirl of criticism surrounding the space tourism industry. “Space is hard” is an understatement. The technology that provides the thrust to get you to space is volatile, the engineering to keep occupants and the vehicle safe must be extremely reliable and durable, and there is nothing about high altitude flight that can be taken lightly. Some question whether space tourism is worth the investment of money and lives. Others question whether there is much scientific value to the flights. All are valid concerns of course, but sometimes as humans we just do things because of the challenge of doing them. I can’t speak to the recklessness of any of the projects, but I remain captivated by the process and am hopeful that space tourism can be accomplished safely and reliably. For several years, X-Aerodynamics has offered a lightly modeled version of SpaceShipTwo and its carrier aircraft, White Knight Two. These aren’t models that feature deeply modeled systems, in fact, they barely model any systems other than the ignition and some basic flight controls. 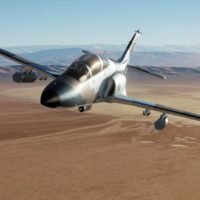 The aircraft are sold together as a pair and unfortunately only feature 2D cockpits, which makes them unusable in VR. The bargain basement price of $10 is indicative of their light modeling, but for fans of highly dynamic sub-orbital flying, the movie ticket price point provides for a good bit of entertainment. The mother-ship carry system is still alive and well more than seventy years after the X-1 was dropped from its B-29 drop ship. 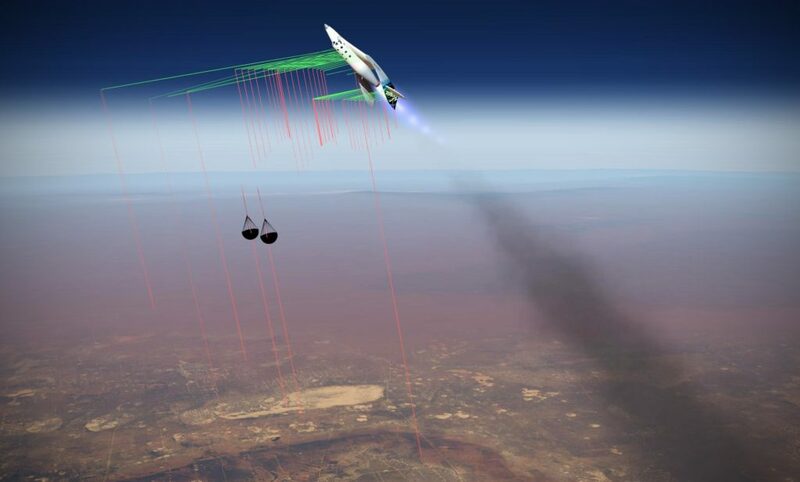 This system allows the rocket planes to be released above much of the thicker atmosphere, giving a boost to performance and payload. SpaceShipTwo (SS2) is carried aloft by the unique Scaled Composites White Knight Two (WK2). With a 141′ wingspan and twin fuselages, WK2 is a quirky looking craft that can carry 37,000 lbs. of payload to 50,000′. With four Pratt & Whitney Canada turbofans offering up 27,600 lbs. of thrust, WK2 was designed with a similar cockpit layout to SS2 to provide for commonality. The X-Aerodynamics 2D cockpit of White Knight 2 is all simplicity and basic functionality. The wide wheel base and wingspan of WK2 requires large enough taxiways to handle the aircraft. 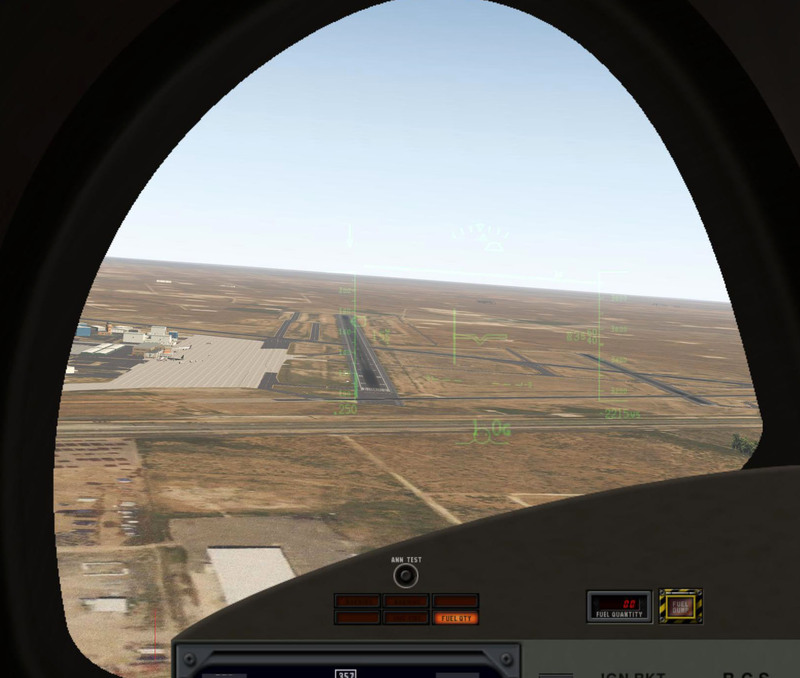 For my test flights, I chose the Christmas Flight stopover destination on my route of Midland International Air and Space Port (KMAF), Texas. Typically, WK2 and SS2 operate from Mojave Air and Space Port (KMHV) in California. Most recently, Midland was home to competitor XCOR Aerospace, also interested in sub-orbital space flights with their Lynx rocket plane. That project seems to be on hold since a 2017 bankruptcy filing. Space is hard. Financing it is even harder. 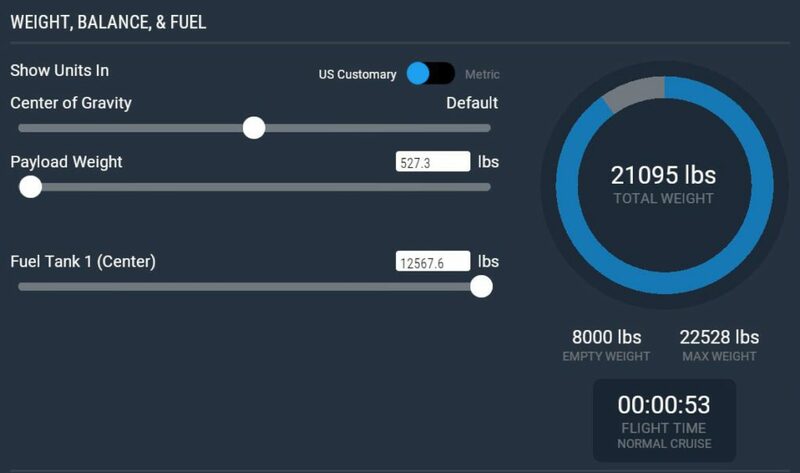 In X-Plane, I found a good load for WK2 to be 24,373 lbs. (simulating the weight of SS2) and two hours of fuel. I’m not convinced that the fuel burn rate that is simulated for WK2 is accurate, but I didn’t do extensive research into that. The climb from takeoff to the drop altitude of 50,000′ took 32 minutes. Initial climb rates were as much as 3,000 fpm at 200 knots, dropping off to around 500 fpm at 180 knots near FL400. 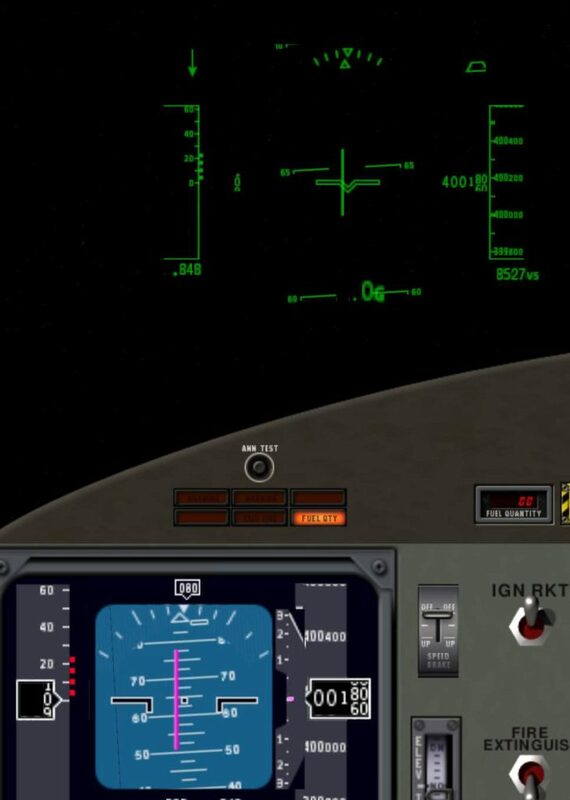 Above FL450, climb rate is anemic as “coffin corner” starts to close in with a climb speed of around 150 knots. 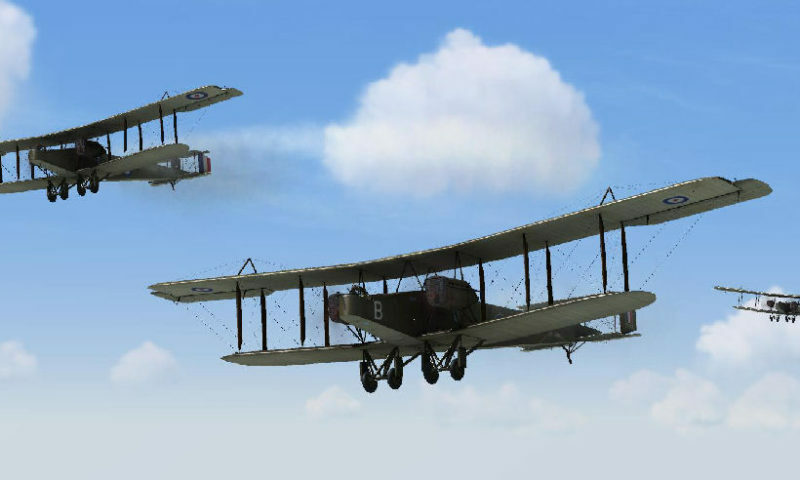 X-Plane allows for two possible scenarios: you can fly in the craft to be dropped, or you can fly the dropping aircraft, but you can’t hot swap between the two. So you have to fly the WK2 + SS2 scenario in two phases if you are shooting for a realistic mission profile. 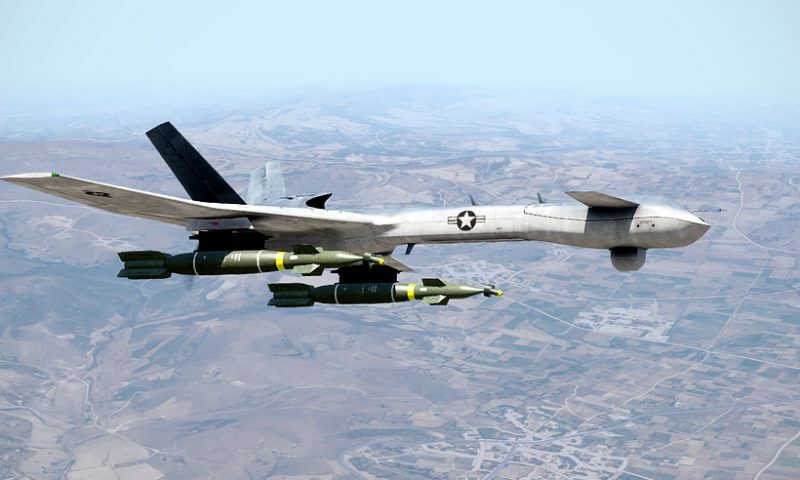 In flying multiple missions, I found that with a drop altitude of 50,000′, you need approximately 100nm of downrange distance to finish your reentry near your intended landing area. For arrival into Midland Space Port, a great start point for the mission is to drop abeam Red Bluff Lake about 90 miles west of the airfield. 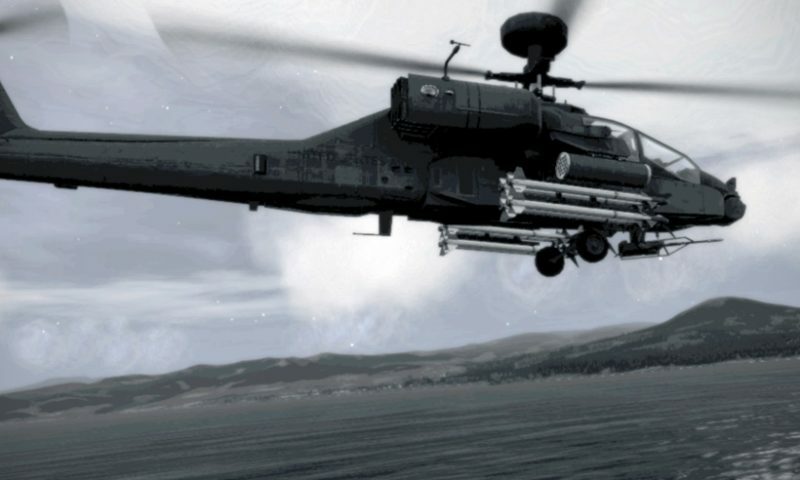 The 090° cardinal heading and easily identifiable landmark makes the mission profile easy to manage. White Knight 2 carrying SpaceShipTwo, full of volatile fuel, over a vast oilfield – what could go wrong? Once abeam Red Bluff Lake at FL500, you are good to go for the drop. At this point, you will have to reload the scenario by switching to SpaceShipTwo and setting it to be carried by White Knight Two in the setup screen. You’ll be placed at an airport of your choosing. Let the AI takeoff in WK2 and establish a climb. Once airborne, go ahead and use the X-Plane map to reposition WK2 over Red Bluff Lake at FL500, heading 090 at 150 or so knots (Mach .62 or so). SpaceShip Two can be set with a payload of around 500-600 lbs. (simulating two pilots and gear) and fill the fuel tank to the maximum 12,567 lbs. The X-Plane menu will indicate that will give 53 seconds of burn time, but I measured 1m+05 seconds of burn time at 100% throttle. There isn’t a wealth of data or information about SS2’s N₂O/HTPB hybrid motor. It uses a polyamide plastic fuel and nitrous oxide oxidizer. As far as I can tell, it IS throttleable, but I don’t know specifically how the SS2 crews operate the engine. Though the cockpits are similar looking, SS2 has a few systems that are different from WK2. Prior to drop, you’ll need to turn on the BATTERY, AVIONICS, and HUD switches. The IGN RKT switch essentially arms the rocket motor and throttle movement will result in immediate thrust from the engine. RCS can be switched on to provide reaction controls in the vacuum of space. Ensure that the FEATHER switch is in the DN position. This switch is, in my opinion, labeled in a way that makes it easy to place this switch in the wrong position. I’d like to see this switch labeled “FEATHER DEPLOYED” and “FEATHER RETRACTED” or something similar to avoid confusion. With your switches set, you are ready to release! Hit the spacebar, and wait a few seconds before hitting the throttle. 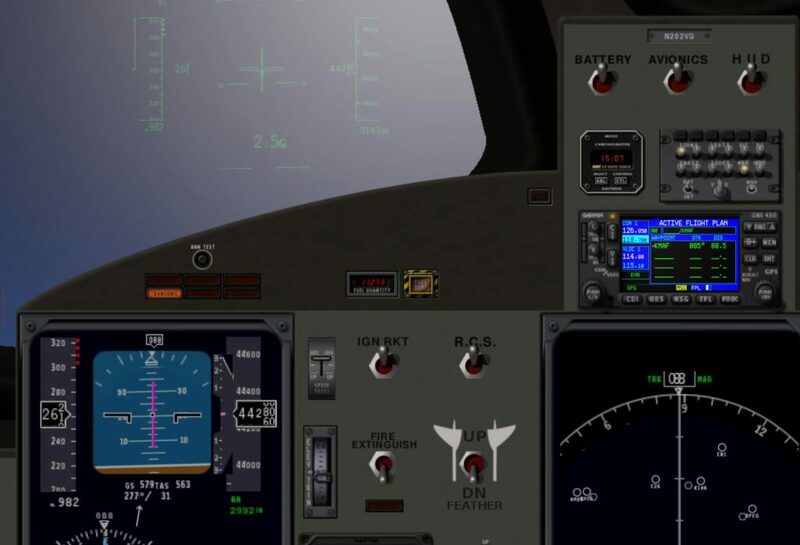 Again, not knowing the actual power settings, I only use about 30% throttle for the initial power application and use a 2.5 to 3.0G pull (as indicated on the HUD) to an 80° pitch setting. You can pretty much bury the stick full aft during this initial pitch up without worrying about stalling. At full aft stick you’ll pull around 2.5G and speed will increase to around 180 knots while your pitch rate will be about 3.5° per second. An AOA indexer would be a nice cockpit addition. 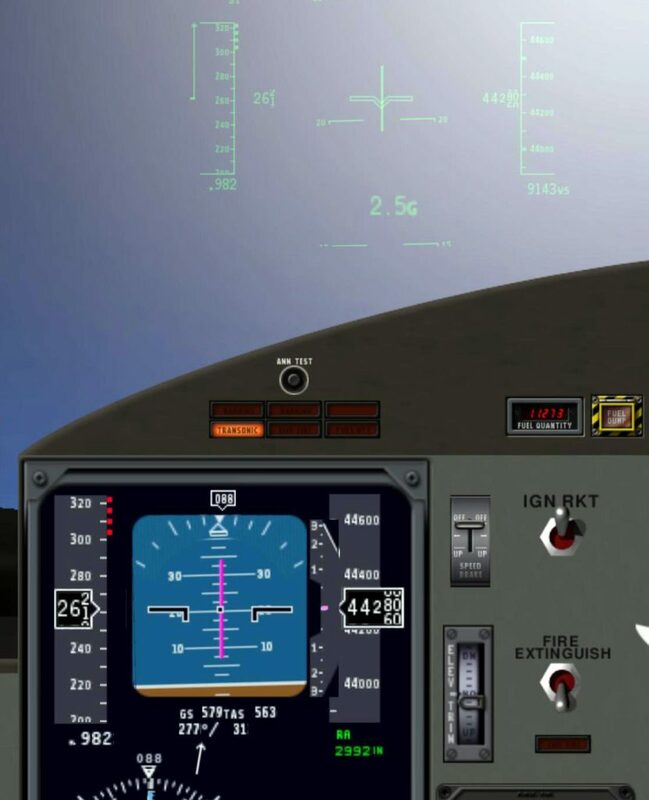 Passing through around 35° of nose up pitch, I smoothly apply maximum throttle and try to get the flight path marker to settle on 80 to 85° while using trim to set hands off stick forces. From drop to establishing 80-85° takes about 20 seconds. Engine burn time is only around a minute, so you’ll want to establish yourself on the proper pitch attitude as soon as possible. Keep a close eye on your heading as well, since once you start to exit the atmosphere at around 80-thousand feet, you’ll be on whatever heading vector you’ve established until reentry. A small deviation in the boost phase can have magnified consequences downrange. 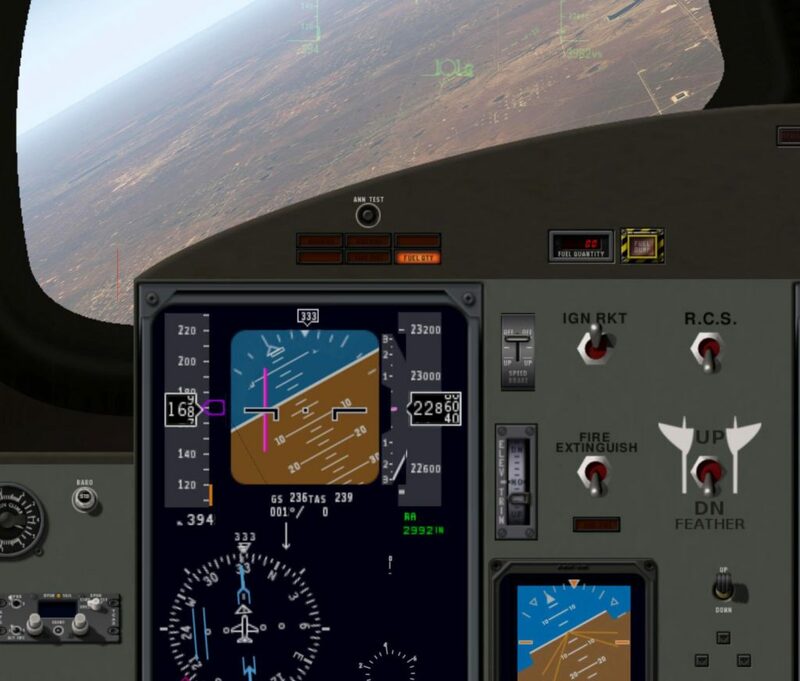 One problem you may run into is hypoxia due to cabin pressurization not working correctly if you are using X-Plane 11. 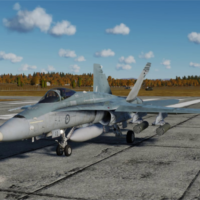 This model is an XP10 design that hasn’t been updated to XP11 systems. The easiest fix is to just go into Plane Maker and under the General 2 tab, set the crew oxygen bottle capacity to some number (I arbitrarily picked 400 liters) and then assign a key in X-Plane to activate the crew oxygen. If your cockpit starts to dim under hypoxia, hit the key combination. Hypoxia will render you unconscious and unable to see the instruments. You’ll want to use your HUD data to monitor your altitude since the PFD altitude tape does not include a hundred-thousands digit. Provided you’ve pitched to around 80° you will experience engine cutoff due to fuel exhaustion at around 130,000 – 140,000′ while going uphill at around Mach 3.8 to 4.0. True airspeed will be around 2,500 knots, while groundspeed will be somewhat dependent on winds aloft but will probably be somewhere in the 600-650 knot range. Remember, your pitch angle will determine your groundspeed, and ultimately your downrange distance traveled. As you continue to coast upwards, you will be able to control pitch, roll, and yaw since the plane has reaction controls. Keep in mind that these inputs have almost no affect on your actual trajectory since you are largely above the atmosphere. You could in fact turn 180° and fly tail first through the edges of space with no ill effects, but you’ll definitely want to realign yourself with your flight path vector prior to reentry. 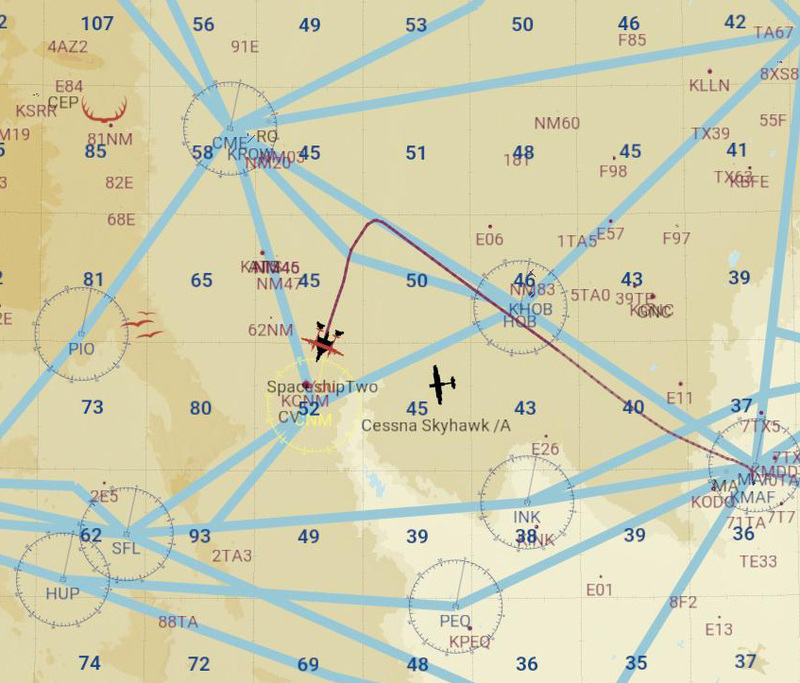 Map showing the flight path back to KMAF and the off axis maneuvering that does not change the downrange track. Apogee on this particular flight will occur at a bit above 400,000′ – zero G on the HUD. The VSI rate, though high, is rapidly diminishing to zero. As you reach apogee, it is time to configure the vehicle to the “feather” condition. In both SpaceShipOne and SpaceShipTwo, controllability on reentry is eased by pivoting the wings upward relative to the fuselage to provide a “shuttlecock” effect that dampens movements and provides a lower speed, higher angle reentry. Move the cockpit switch to the UP position to enable the feather. The X-Aero model does not include movement of the wings, instead, they have used small drogue chutes that are almost invisible above the airplane to simulate the drag effect that the feather has on the vehicle. It is a good solution with what appears to be accurate replication of the drag that the feather would otherwise provide. It is recommended to be in a level attitude during rentry, and apply near full nose up pitch trim to help the aircraft recover as aerodynamic forces are recovered at lower altitude. Flight model output showing the lift and drag vectors imparted by the two parachutes that simulate the feather system on SpaceShipTwo. Local airflow output showing SpaceShipTwo in the feather configuration with the vehicle dropping nearly straight down. As you descend under “feather” you’ll notice G-forces starting to accumulate and an increasing Mach number maxing out at around M3.3. At 165,000′ you’ll be indicating 1.8G and M3.3. At 120,000′ 5G. By 100,000′ G will have diminished to around 3.0G at M1.05. Unfeathering, or returning the wings to an aerodynamic configuration, should occur around 90,000′. At this point, G forces will be near 1.0 and speed will be down to Mach .6 or so. 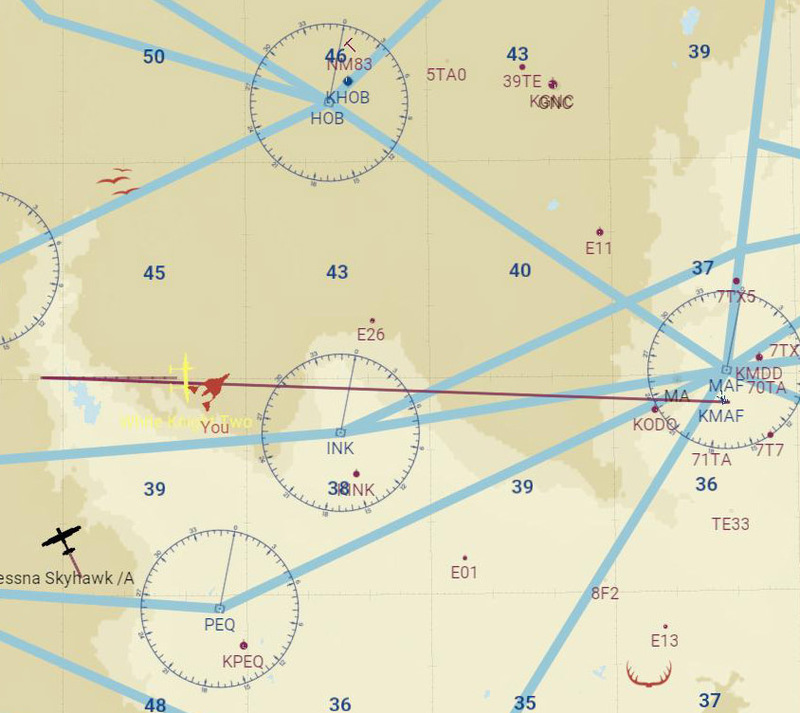 If you started at 90-100nm from your destination, you should be around 35nm from the airport. Upon retraction of the feather, the nose will pitch down to around -60° and a 2G pull to -15° pitch will complete the transition to normal, gliding flight at 70,000′. Total descent time from 400,000′ to 100,000′ takes about 2’+40″. After the feather is stowed at around 90,000′ normal airflow resumes across the wings and lifting body. As we transition to gliding flight, we can see White Knight 2 down at 50,000′ following the baseline heading. Now it is time to spot the landing area. This is actually where flying from Mojave or Edwards AFB would be a bit easier since the dry lake bed landmarks are much easier to see to maintain orientation. Arrival over KMAF should occur in the vicinity of FL350, giving you plenty of maneuvering room for the approach and landing. 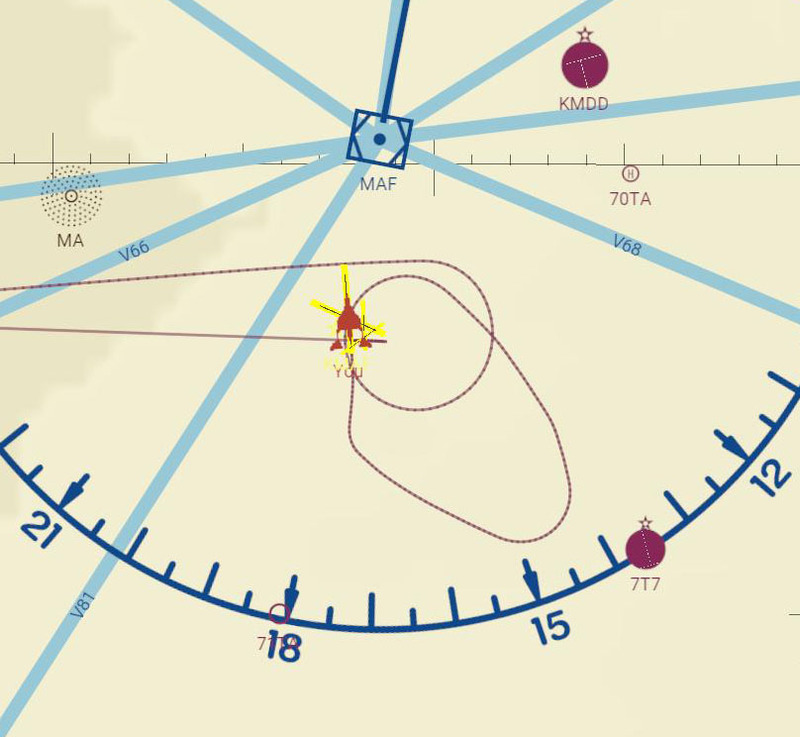 An indicated speed of 170 knots results in roughly 5,000 fpm descent rate. 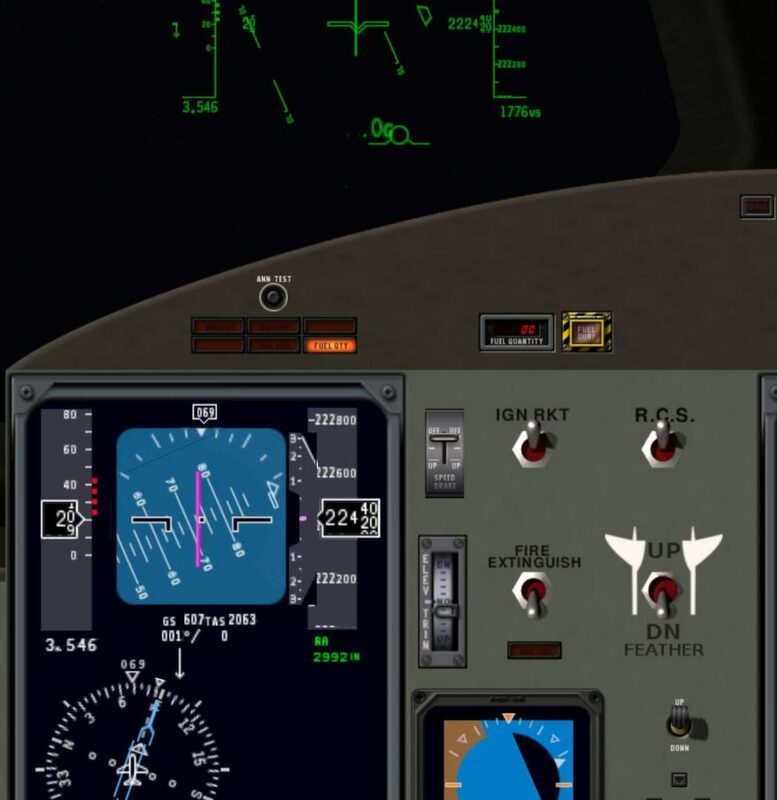 A 30° bank at 170 knots will give you a 180° turn with a loss of around 5,500′. A 360° will lose you 11,000′. At lower altitudes (10-20,000′) 170 knots will give you around 3,000-3,500 fpm and speedbrakes can increase that to around 4,500 fpm. The airplane will develop an excessive sink rate at 120 knots, so speed should be kept at around 170-180 knots. The only way to truly nail the overhead pattern is to learn how many turns you’ll need vs. the altitude you need to lose. All of this is contingent on your altitude and energy upon arrival overhead. Needless to say, you’ll want to conserve enough energy and altitude to safely make the landing runway, without being so conservative that you end up high and fast, overshooting the runway. That is why the 7.5 mile long dry lake bed runway at Edwards is loved so much by rocket pilots. 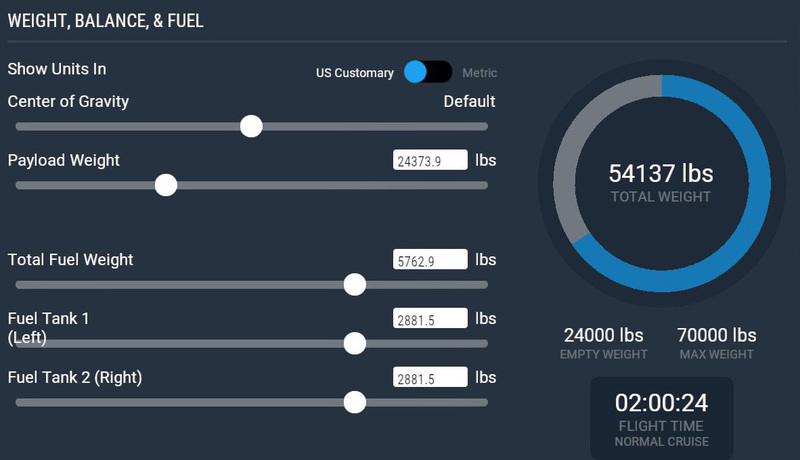 The entire flight profile with captured flight, release, boost, reentry, pullout, glide, and overhead recovery. I was also curious what would happen if I duplicated the premature feather unlocking that doomed VSS Enterprise in October 2014. The NTSB report on the breakup makes for interesting reading, and provides some insight into the time pressures put on the pilots during such a compressed flight as a sub-orbital rocket plane flight. When I activated the feather function at the same point in flight as the flight data recorded, I experienced an 18G pitch up, probably similar to the forces that destroyed VSS Enterprise. After an extensive investigation, pilot retraining, and the implementation of safety devices, VSS Unity took to the skies on July 26, 2018 and attained a flight program maximum speed of Mach 2.47 while climbing to 170,800′. Ultimately, SS2 is designed to reach Mach 3.5 and 360,000′ (68 miles). It is still unclear who, or when, the first sub-orbital “space tourist” flight will occur. Of interest to us X-15 fans – the original SpaceShipOne, piloted by Brian Binnie, on the flight that claimed the Ansari X Prize, attained an altitude of 367,500′ breaking the previously held record by X-15 pilot/astronaut Joe Walker set in 1963 of 354,200′. 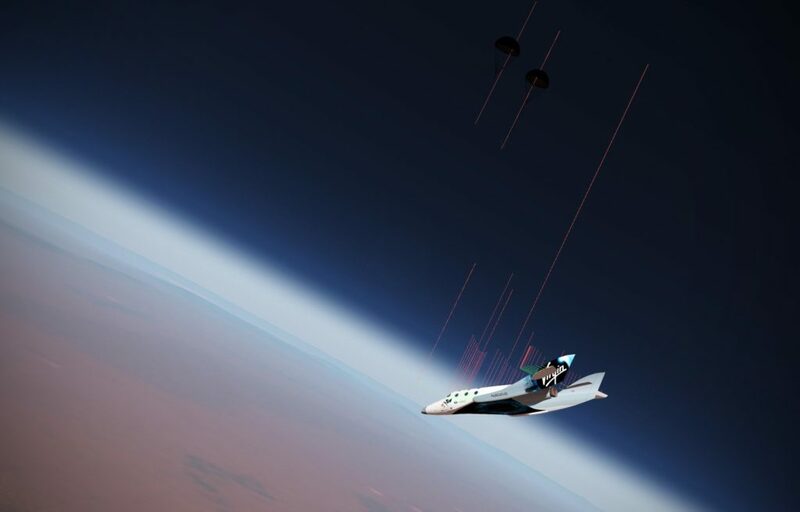 The SpaceShipTwo / White Knight Two package can be found here at X-Plane.org for $10. Keep in mind, it is not a deep simulation of aircraft systems, but rather a fun stick and rudder (and RCS?) simulation that gives a good replication of the very dynamic boost and recovery of SpaceShipTwo. @AeroMechanical (and I wish @EinsteinEP) - I would love some feedback on everything I got wrong in this article…! I specifically had a question - why does SpaceShipTwo not have to contend with the heating problems that the X-15 had to deal with? I mean, it is coming down (more vertically) at M3.0 or so…I would have thought the bottom of the vehicle would get as hot as the X-15? The ship converts (via pneumatic-actuated feather) to a stable, high-drag shape for atmospheric entry. This “care-free” configuration allows a “hands-off” re-entry and greatly reduces aero/thermal loads. Yeah, I figured that had something to do with it. The “shuttlecock” mode perhaps lets it penetrate into the atmosphere at a steeper angle with less speed as opposed to the X-15 that needed a lot of forward momentum and sliced more diagonally through the atmosphere for a longer period, heating it up for a longer duration. I would have thought that the steeper descent of the Scaled planes would have had higher G-loading but maybe not. Whatever the case, SS1 and SS2 look pretty flimsy…but they must be constructed to pretty high tolerances. Here is a great video of SpaceShipOne making a similar type flight profile…it is interesting to see the data readout on the left side showing the altitude, G, and Mach number… Looks like a maximum G of around 3.1 or so at around 100,000’ and Mach 1.5 with a maximum Mach of 2.48 on the boost and M 1.93 on the feathered recovery. Isn’t heat a function of pressure (IAS) as much as compressibility? Early 60’s near space flight was done in planes that held high Mach values to relatively low altitudes. Thus the heat. SS1 quickly transitions to GA speeds as the atmosphere thickens. CNN article where Richard Branson implies that space is within the reach of SpaceShipTwo…perhaps before Christmas! Caution - the interviewer is really…uh grating…for some reason. I wish I could have interviewed him! Looks like they made it to 50 miles…! Until this thread I had never heard of the Karman line. Now that I have, I say Virgin came up 14 miles short. They get any higher and they may see Aurora flying around the dessert.